My wife got me the iGrill for my birthday. 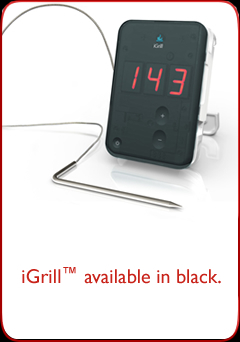 I BBQ and grill quite a lot, so having a remote thermometer that reports/interfaces remotely via Bluetooth to my iPhone/iPad sounded like a geek’s dream. Ultimately, it’s useful, fun and and easy to use. The downside is that it’s constantly off by 10-12 degrees when measured against my infrared and calibrated direct-probe thermometers. This has led to undercooked and overcooked meat — not fun on either end of the spectrum. Overall, with this in mind, I set my temperature thresholds with this buffer in mind for grilling. For BBQ, it’s far more useful because I can use one of the probes for the meat temp and the other for the internal BBQ temp…and watch for variability. THIS is what I find it very useful for, even with the inaccuracy. All told, I find it a useful — if not inaccurate — tool.